Knife sharpening can be as up-to-date as the rest of your operation because the Tru Hone System gives you a perfectly sharpened blade in a fraction of the time required by old fashioned methods. Tru Hone has proven it can solve the cost and labor problems that outdated stone sharpening presents. It is designed to do the complete job - sharpening, thinning and honing - quickly, precisely and economically. It takes less than a minute to put a perfect edge on a blade with the Tru Hone. Contrast this with the time it takes using outdated sharpening methods; labor costs for this crucial job are greatly reduced with Tru Hone. The Tru Hone Knife Sharpening System can add as much as 50% to the life of a knife because it removes only as little metal as necessary to produce a sharp edge. It simultaneously develops consistenly equal bevels on both sides of the blade resulting in a precise and strong edge. The Tru Hone quickly and easily restores nicked or chipped blade edges; a tedious chore when done by conventional methods. 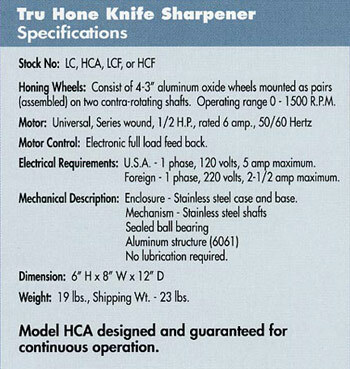 Tru Hone's patented mechanism allows two pairs of honing wheels, mounted on parallel shafts, to contra-rotate and change the overlap during the sharpening operation. At the intersection of the honing wheel overlap, the motion of the wheels is upward into the knife blade creating a precise angle. Along with the capability to change the overlap of the honing wheels, the upward rotation produces consistent, exacting bevels which results in a stronger cutting edge. A solid-state variable speed control regulates and maintains the selected speed of the 1/2 horsepower motor. Replacement honing wheels are needed only after thousands of sharpenings and are available in different grits. The Tru Hone System is enclosed in a stainless steel case so it is built to last and easy to clean. All rotating shafts are also stainless steel and sealed ball-bearings assure long, trouble-free life. The system is virtually maintenance free. The Tru Hone System is designed for safety. A built-in knife blade enclosure encases the knife's cutting edge as it is guided across the honing wheels. This contrasts with a belt sharpener or stone in which the knife edge is exposed throughout the sharpening operation. The Tru Hone machine was conceived, designed and tested with one idea in mind - to meet the exacting requirements of the professional. The Stone Age of Knife Sharpening Ends with Tru Hone.